Texas has one of the largest economies in the country and the construction industry is booming as a result. Because of this boom, contractors regularly find themselves facing the need to file a lien to ensure they are paid for their work. Thankfully, the basic process to file a mechanics lien in Texas is not complex. This blog will give you an overview, but if you’re looking for more details, view our state fact sheet. Filing a lien may seem intimidating at first, but once you understand the process, it’s really just a matter of keeping up with dates and using the right paperwork. First, you need to file your notice. This is a way of letting a property owner, which you may not have directly contracted with, know that you haven’t been paid for work performed. In many cases, filing the first notice resolves your problem as the property owner doesn’t want to lien hanging on and takes steps to ensure you get what you’ve worked for. And you’ve contributed to a construction or improvement project, then you’re qualified to file a mechanics lien. On the other hand, if you just cleaned someone’s house, you probably are not qualified to file a lien. Once you’ve determined you’re eligible to file a lien for unpaid invoices, start drafting your notice. 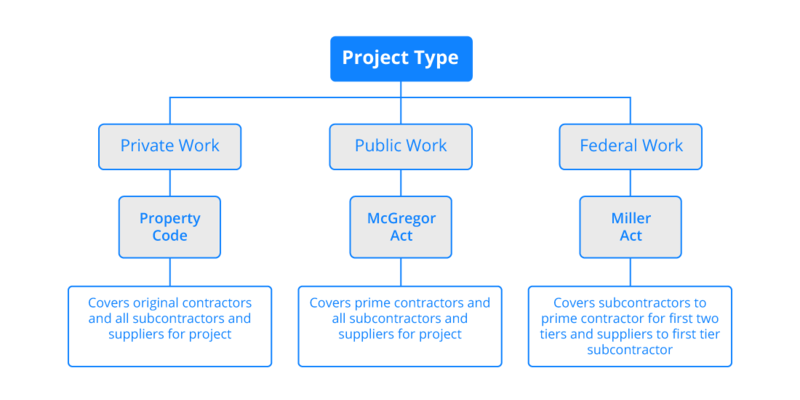 The specific notices you need to send vary depending on whether the project is residential or not and whether you contracted with the owner, the general contractor, or a third party. Texas mechanics liens also have some special categories for notices when you provided specially fabricated materials or performed work on homesteads. Use our chart to help you file the right notice at the right time. Keeping up with the timing and getting your notices out before the deadline is critical to the success of your mechanics lien. 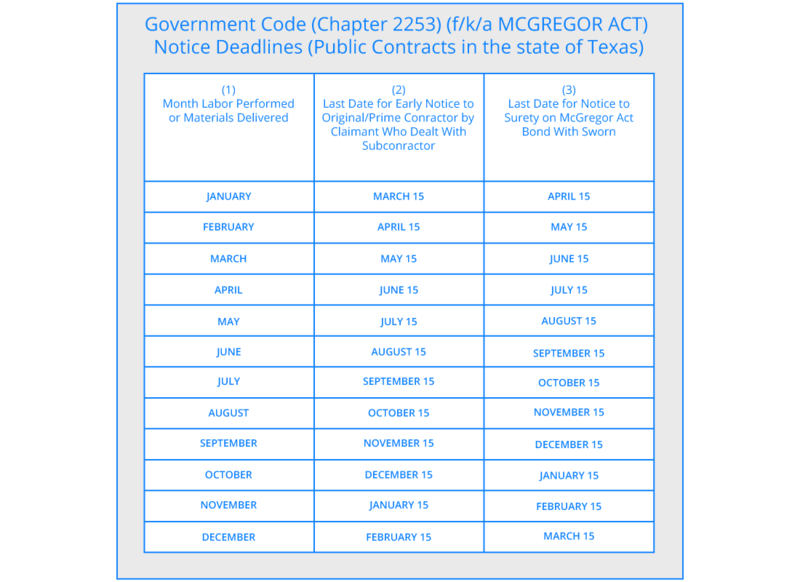 Texas requires notices to be sent at two and three months after your work on the project, with the deadlines falling on the 15th of each month. So, for example, if you performed the work in January and have not yet been paid, your two month notice is due on March 15th and your three month notice is due April 15th. Make sure you include all the relevant information in the notice, similar to what is needed in the actual lien. This makes it easier for the property owner to understand who you are, what work you did, and what you’re claiming hasn’t been paid. Your information, including name, address, and contact information, so it’s clear how to get in touch with you in the future. It is a good idea to attach a copy of your contract and other supporting documents. 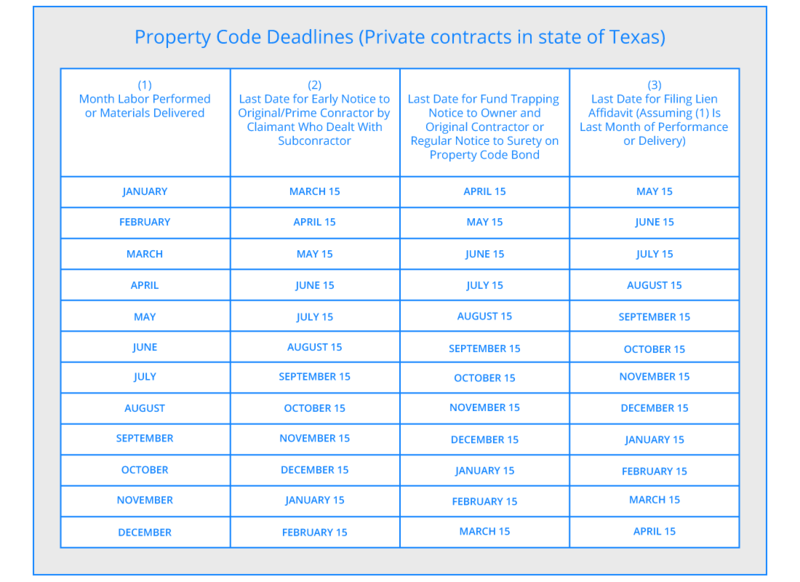 Each county in Texas has different formatting requirements and filing fees for a mechanics lien. Make sure you check with the county to learn their preferences on margin, paper size, color, and how they want you to pay the accompanying fee. You also have to serve the lien within 5 days of filing, which can be done through certified mail with return receipt requested. This generally means going down to the post office and filling out a green slip that attaches to the envelope you mail. When the package has been successfully delivered, the post office returns the green slip back to you in the mail for you to keep in your records to show that you properly served the lien. Thankfully, the vast majority of mechanics liens are paid without any further legal efforts. If the lien is paid, you don’t have to worry about follow-up legal action or getting obnoxious with collections calls. Generally, property owners do not want liens on the title as it makes it harder to sell the property and they are quick to contact you and settle the issue. It may take some time if, for example, your lien is part of an on-going dispute between the owner and general contractor, but filing a lien means that you can be comfortable that you’ve been noticed and will eventually get paid. In Texas, a mechanics lien does not cloud the title forever, meaning that it will eventually go away and the property can be sold without paying your claim. So if you don’t get paid, you have 1-2 years to enforce your lien through the legal system. Make sure you keep track of when your lien was filed and whether you get paid so that you can proceed in a timely fashion with any necessary enforcement action. This process sounds straight forward, but it has a number of little details that have to be remembered and dealt with. At National Lien & Bond, we not only track and make sure notices and liens are handled properly and on time, we also let you know when it’s time to start an enforcement action to make sure you get paid for the work you’ve performed.